This is the current flag of the United States. This flag became the official United States flag in 1960 when a star was added for the State of Hawaii. It replaced the short-lived 49-star flag (July 4, 1959 – July 3, 1960) honoring the State of Alaska. An Executive Order by President Eisenhower provided for the arrangement of the stars in nine staggered horizontal rows. Its always a shame when you forget to wish somebody important a "Happy Birthday" or a "Happy Anniversary," but as a nation we pretty well forgot the 50-star flag's "50th Anniversary" (1960-2010). This veteran flag has been the longest used version of Old Glory and has seen us through some of the most challenging times in our nation's history, yet it's anniversary was pretty much ignored by our government and the press. There have been many versions of Old Glory and many Star Patterns used through the years (see The Many Constellations of Old Glory), but this has been the longest used. Several suggestions for special 50 year versions of the flag were suggested, but they were ignored by the powers that be... so I can only personally wish Happy Birthday to our faithful old friend. The District of Columbia is not a state, but a special area set aside for the capital of the United States of America. In 1790, the United States Congress approved the creation of a permanent national capital, but it was decided to place it in a special independent federal district and not be a part of any state. Washington DC would be built on land next to the Potomac River which had been donated by the states of Maryland and Virginia. The Virginia portion was never used and returned to the state by Congress in 1846. A flag contest was announced to secure a design. On October 15, 1938, the design made by Charles A. R. Dunn was selected for the flag of the District of Columbia. Dunn had first become interested a flag for DC in 1917. In reviewing the state flags, Dunn was impressed by the flag of Maryland and not impressed by the flags of those states that depicted their seals on their flag. In 1921, he drew up his flag proposal, consisting of the coat-of-arms of George Washington (two red bars and three red stars on a white field). He also provided a chart depicted ways the flag could be used in designing flags for local governmental agencies, as well as civic organizations. The final selection of his design was made by the Flag Commission with the advice of the Commission on Fine Arts. The flag was first hoisted at the International Horse Show held in Washington DC in October of 1938 by Commissioner Hazen. Alabama became the 22nd state of the Union on December 14, 1819. Alabama was originally part of British West Florida (1763–1810) after the Spanish lost control of the area, then part of the State of Georgia before the state ceded its western portions to the federal government, then part of the Mississippi Territory (1798-1817), finally becoming the Alabama Territory (1817-1819) just before becoming a state. The current Alabama state flag was adopted in 1895. The state flag consists of the red cross of St. Andrew on a field of white. The modern Alabama state flag paid some historical tribute to Spanish rule, but was definitely patterned after the battle flag of the Army of Northern Virginia. The flag of Alabama was created under the administration of Governor William Oates, a former regimental commander in the Army of Northern Virginia. Alaska was purchased from the Russian Empire in 1867. It went through several name and administrative changes, first the Department of Alaska, then the District of Alaska, then the Alaska Territory in 1912, and finally the 49th state of the Union on January 3, 1959. The Alaska state flag was designed by John Benson, a thirteen year-old in an orphanage who entered a contest sponsored by the American Legion in 1927. The flag became the Territory of Alaska's official flag. The flag is dark blue, with eight five-pointed gold stars in the shape of "the Big Dipper" and a larger gold star representing the pole star of Polaris. Arizona is the 48th state and was admitted to the Union on February 14, 1912, but did not adopt its flag until 1917. Arizona was at first the Confederate Territory of Arizona (1861-1863), then it was re-captured by the Union, and was named a US Territory from 1863-1912. The Adjutant General of the Arizona Territory, Charles Harris, designed the flag in 1911. The Blue and yellow are the Arizona colors, and red and yellow the colors of the Spanish Conquistadors headed by Coronado, who first came to Arizona in 1540. The copper star represents Arizona as the largest producer of copper in the nation. The Territory of Arkansas was organized in 1819 and on June 15, 1836, became the State of Arkansas. Arkansas was the 25th state and became the 13th slave state. The current Arkansas state flag was designed by Miss Willie K. Hocker of Wabbaseka, Arkansas, in a contest sponsored by the Daughters of the American Revolution out of 65 entries and officially adopted in 1913. On a rectangular field of red, Miss Hocker had placed a large white diamond bordered by twenty-five white stars on a blue band. Three blue stars in a straight line were centered in the diamond, but the legislature modified the design several times finally producing the current design in 1924. In 1846 settlers rebelled against Mexican rule and raised the first "Bear Flag" at Sonoma. The Republic's first and only president was William B. Ide. His term lasted 22 days as the new Republic was in the process of being occupied by U.S. forces because of the Mexican-American War. The California Gold Rush of 1848-49 then quickly populated and transformed the territory into the 31st State of the Union on September 9, 1850. The current California Bear Flag, based on the Todd flag of 1846, just celebrated its 100th year in 2011. The Bear Flag had been informally used by the Californians both in June celebrations of the Bear Flag Revolt for years and in September during the Admissions Day parades and events. But it wasn't until 1911, that California Governor Hiram Johnson signed the bill making the Bear Flag the official State Flag. To learn more visit the Flags Over Early California page. Colorado was the 38th State admitted to the Union on August 1, 1876. It was formally the Territory of Colorado between 1861-1876. The territory was organized because of the Pike's Peak Gold Rush of 1858–1861, which brought the large concentrations of people to the region. The Colorado State flag was adopted on June 5, 1911, by an act of the General Assembly. The colors used in the state's flag are symbolic of certain geographical features of the state. The gold stands for the abundant sunshine that Colorado enjoys. The white symbolizes their snowcapped mountains. The blue stands for the clear blue skies in Colorado while the red represents the ruddy color of much of the state's earth. The flag was originally designed by Andrew Carlisle Johnson in 1911. In 1929, the precise colors of red and blue were stipulated to be the same as the national flag. Connecticut became the 5th State of the United States of America on January 9, 1788. Originally the British Connecticut Colony, then one of the original 13 sovereign states under the Confederation (Articles of Confederation 1781-1789), it was the 5th state to ratify the new United States Constitution. Abby Day Slocomb, the wife of Confederate Captain Cuthbert Slocomb, the company commander of the famed New Orlean's Washington Artillery during the Civil War, is responsible for the Connecticut State flag. 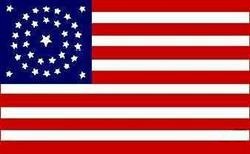 Abby was appalled that Connecticut did not have a state flag and under her leadership, the Daughters of the American Revolution (DAR), submitted a number of flag designs and Slocomb lobbied the State to accept one. In 1897 an official flag, based on a DAR design, was adopted. The azure blue design includes a shield with gold and silver embroidery, with three joined grapevines standing for both religion, liberty and knowledge, and the three earliest colonies in the state (Hartford, Windsor and Wethersfield). The banner on the flag shows the state motto, Qui transtulit Sustinet (He who hath transplanted will sustain). Delaware became the 1st State of the United States of America on December 7, 1787. Originally under the British called the "Lower Counties on Delaware," or the lower counties of Pennsylvania, it became one of the original 13 sovereign states under the Confederation (Articles of Confederation 1781-1789), it was the 1st state to ratify the new United States Constitution, hence it's nickname "First in the Nation." The original design of the Delaware flag dates back to the Revolutionary War, but long years of disagreement as to the exact shades of the colors, "colonial blue" and "buff," for example, continued until 1954 legislation. Historically, the colors of the New Jersey flag (buff, with the shield primarily in blue) were selected due to the fact those were the colors of the state's soldiers during the Revolutionary War. The coat-of-arms shown on the flag was originally adopted on January 17, 1777, the design of Philadelphia heraldic artist Pierre Eugene du Simitiere, as "a Sheaf of Wheat, an ear of Indian Corn and an Ox in full Stature, in a Shield, with a River dividing the Wheat Sheaf and Ear of Indian Corn from the Ox, which is to be cut on the nether part of the shield below the river; that the Supporters be an American soldier under arms on the right, and an Husbandman with a hoe in his hand on the left; and that a Ship be the Crest." Florida became the 27th state of the Union on March 3, 1845. Prior to the time it was originally the Spanish territory of la Florida, and later called the provinces of East and West Florida, before it was ceded to the United States as part of the 1819 Adams-Onís Treaty. Under United States administration it became the Florida Territory (1822-1845) before becoming a state. The Florida state flag may pay some historical tribute to Spanish rule in its design, it was definitely patterned after the battle flag of the Army of Northern Virginia under which the bulk of the troops from Florida fought. The flag was first adopted in 1900, but revised in 1985 to conform to a corrected state seal. The previous state seal had several errors. The revised Seal has a Seminole Indian woman rather than a Western Plains Indian, the steamboat is more accurate, and the cocoa palm has been changed to a sabal palm as the legislature prescribed in 1970. Georgia became the 4th State in the United States of America on January 2, 1788. Originally the British Province of Georgia, it became one of the original 13 sovereign states under the Confederation (Articles of Confederation 1781-1789), and it was the 4th state to ratify the new United States Constitution in 1788. The State of Georgia has changed its flag at least eight times since the Civil War, in 1865, 1879, 1902, 1906, 1920, 1956, 2001, and in 2003. The 1956 design featured the battle flag of the Army of Northern Virginia prominently, and not considered "politically correct" by some Georgians. The last change was the result of a statewide public referendum in 2004 when the voters got to choose between the unpopular 2001 flag and a new 2003 flag. The 1956 flag was not included as a choice. The new flag is based on the first national flag of the Confederacy, within the canton of the flag is a circle of 13 white stars, symbolizing Georgia and the other 12 original states that formed the United States of America. Within the circle of stars is Georgia's coat-of-arms, as adopted in 1799, above the words "In God We Trust," both in gold. The Territory of Hawaii became the 50th State to be admitted to the Union on August 21, 1959. The Kingdom of Hawai‘i (1795 to 1810) consisted of the islands of Hawai‘i, O‘ahu, Maui, Moloka‘i, Lana‘i, Kaua‘i and Ni‘ihau was ruled by the chiefdom of Hawai‘i under one unified government. The Kingdom was overthrown by American Planters and became the Republic of Hawaii (1894-1898) and then the Hawaii Territory (1898-1959). The flag used as that of the Hawaiian Territory and the modern state are identical, but like most U.S. states with uniquely proportioned flags, Hawaii's government has also accepted U.S. flag industry proportional standards and use both both type flags. The modern flag is almost identical to the flag of Kingdom of Hawaii Flag (1845-1898), with the number of stripes reflecting the number of major islands in the Hawaiian Kingdom at that time. To learn more visit the Flags of the Kingdom of Hawaii 1810-1898. Part of the Idaho Territory became the 43rd state admitted to the Union on July 3, 1890. The original Territory of Idaho was a made a US Territory in 1863 by President Abraham Lincoln and remained one until 1890. The original newly organized territory covered most of the present-day states of Idaho, Montana and Wyoming. The origins of the Idaho State Flag was the First Idaho Infantry Battle Flag used in the Philippines in 1899 during the Spanish American War. By a legislative act in 1907, a flag containing the same Idaho Territorial Seal on the blue field, but with the name of the regiment under the picture replaced with the words "State of Idaho," was adopted as the state flag. The seal in the center of the flag symbolizes Idaho´s main industries: mining, agriculture and forestry. It was created in 1890 by Emma Edwards Green, the only known woman to design a state seal. After a Meridian Elementary fourth grade class discovered the original flag, ragged from wear, had just been stored away, they began fund raising to restore it. Because of their efforts, the original Idaho flag, now cleaned, mended, and preserved, is on permanent display in the Idaho Historical Museum in Boise. The southern portion of the Illinois Territory was admitted to the Union as the State of Illinois on December 3, 1818, as the 21st State. The Illinois Territory (1809–1818) was formed from lands of the old Northwest Territory (1787–1803). The original Illinois flag was created in a contest sponsored by the Daughters of the American Revolution. They selected the design of Lucy Derwent as winner and the design was approved by the General Assembly on July 6, 1915. The flag law that was originally adopted in 1915 allowed the emblem to be in either in color or in black. Therefore in 1970, NAVA member Florence Hutchison of Illinois convinced a state legislator to introduce a bill re-defining the state emblem on the flag and adding the state name to the flag. The flag of the State of Illinois now consists of the Seal of Illinois on a white background, with the word "Illinois" underneath the seal. In the eagle's beak there is a banner with the state motto "State Sovereignty, National Union." The dates on the seal, 1818 and 1868, represent the years that Illinois became a state and the year in which the Great Seal was designed by Sharon Tyndale. The Indiana Territory was admitted to the Union as the 19th state on December 11, 1816. The Indiana Territory (1800–1816) was formed from lands of the old Northwest Territory (1787–1803). In 1816, a constitutional convention was held in the territory and a state government was formed, after which the US Congress granting statehood to Indiana. The flag of the State of Indiana was adopted by the state legislature in 1917 as the result of a competition won by Paul Hadley of Mooresville. The 13 stars in the outer circle represent the 13 original States. The inner semi-circle with 5 stars represent the 5 other States adopted into the Union before Indiana. The star directly above the torch symbolizes Indiana as the nineteenth State of the Union. The torch is a symbol of liberty and enlightenment. The southeastern portion of the Iowa Territory became the 29th state admitted to the Union on December 28, 1846. The Territory of Iowa (1838-1846), comprised a large portion of the territory that was originally part of the Louisiana Purchase, plus a part of the Missouri Territory. The original boundaries of the territory included Minnesota and parts of the Dakotas, and consisted of about 194,000 square miles of land. The banner designed by the Iowa society of the Daughters of the American Revolution and presented to the state was adopted as the state flag in 1921. Dixie Cornell Gebhardt, a Knoxville native is remembered as the designer of the flag. Gebhardt's design was originally an Iowa regimental banner. At that time, Iowa's guardsmen were doing military duty along the Mexican border, and had no state banner to signify their regiment. The governor ordered Gebhardt's banner be sent to the men, and later it became the state flag. The design consists of three vertical stripes of blue, white, and red, the blue stripe being nearest the staff and the white stripe being in the center. On the central white stripe is depicted a spreading eagle bearing in its beak blue streamers on which is inscribed the state motto, "Our liberties we prize and our rights we will maintain" in white letters, with the word "Iowa" in red letters below the streamers. Kansas became the 34th state of the Union on January 29, 1861. It had been the eastern portion of the Kansas Territory (1854-1861), which was established by the Kansas-Nebraska Act. The most important provision of the Act repealed the Missouri Compromise of 1820 and allowed the settlers of Kansas Territory to determine by popular sovereignty whether Kansas would be a free state or a slave state, which in turn resulted in the violence known to history as "Bloody Kansas." From 1925 to 1927, Kansas used a state banner instead of a flag. The Kansas state banner, which consisted of a large sunflower and the word "Kansas" on a blue field, was intended to be hung from a horizontal bar, rather than a vertical flag pole. It was replaced with the true flag of the State of Kansas, adopted in 1927. It was first flown at Fort Riley by Governor Benjamin Paulen in 1927 for the troops at Fort Riley and for the Kansas National Guard. The elements of the state flag stayed the same, with a state seal added to the sunflower. This original design was modified in 1961 to add the name of the state at the bottom of the flag. Kentucky became the 15th state of the Union on June 1, 1792. Previous to this, it had been part of the lands claimed by the Commonwealth of Virginia, and since 1776 called Kentucky County. In 1780, Kentucky County was legally abolished and divided into the Fayette, Jefferson, and Lincoln counties of Virginia. These four counties then petitioned to secede from Virginia, and eventually, in 1792, the Commonwealth of Kentucky was formed and was admitted to the United States as its fifteenth state. It is also one of the four states to retain the English tittle of Commonwealth. The Kentucky State Flag was designed by Jesse Cox, an art teacher in Frankfort, Kentucky. The flag was adopted by the Kentucky General Assembly on March 26, 1918. The flag consists of the Commonwealth's seal on a navy blue field, surrounded by the words "Commonwealth of Kentucky" and sprigs of goldenrod, the state flower. The seal depicts two friends embracing. Popular belief claims that the buckskin-clad man on the left is Daniel Boone, who was largely responsible for the exploration of Kentucky, and the man in the suit on the right is Henry Clay, Kentucky's most famous statesman. However, the official explanation is that the men represent all frontiersmen and statesmen, rather than any specific persons. The state motto: "United We Stand, Divided We Fall" circles them. Louisiana became the 18th state of the Union on April 30, 1812. Previously, all of the Louisiana Purchase south of the 33rd parallel became part of the Territory of Orleans (1804–1812), and the remainder became the short-lived federally administered military district called the District of Louisiana (1804), after which it was put under the jurisdiction of the Indiana Territory (1800–1816). It should be noted that the "Louisiana District" had been previously an administrative division under Spanish and French rule. In 1812, the Orleans Territory was admitted to the Union as the State of Louisiana. The flag of Louisiana consists of a heraldic charge called a "pelican in her piety," representing a mother pelican who has wounded her breast to feed her young from the blood. In 2006, the Louisiana State Legislature passed a bill which required that only three drops of blood be shown on her chest. This symbol of Christian charity is also found on the state seal. On the flag it is depicted above a ribbon with the state motto "Union, Justice, and Confidence." The current flag was adopted in 2006, revising the original pelican design of 1912. The District of Maine became the 23rd state of the Union on March 19, 1820. The District of Maine was a legal designation for what is now the State of Maine, which existed from American independence until the Missouri Compromise in 1820. Maine was the northern part of Massachusetts, when as a result of the growing political infighting between the pro-slavery and anti-slavery factions in the United States Congress, it became a free state to balance the numbers of slave and free states, allowing Missouri into the union as a slave state. The flag of the State of Maine features the state coat-of-arms on a blue field. In the center of the shield, a moose rests under a tall pine tree. A farmer and seaman represent the traditional reliance on agriculture and the sea by the state. The North Star represents the state motto: Dirigo (I Lead). There are no official colors for the coat of arms, so variations in coloration can be seen in flags from different manufacturers. The blue field, however, is specified to be the same blue as in the flag of the United States. According to the official description, the flag should have a fringe of yellow silk and should have a blue and white silk cord attached at the spearhead. These embellishments are very rarely observed. The Maine legislature approved the current flag on February 23, 1909. The Province of Maryland became the 7th state to be join the the Union on April 28, 1788. Originally the British Province of Maryland, it became one of the original 13 sovereign states under the Confederation (Articles of Confederation 1781-1789), and it was the 7th state to ratify the new United States Constitution in 1788. The flag of the State of Maryland consists of the heraldic banner of George Calvert, 1st Baron Baltimore. It is the only official state flag in the United States to be based on English heraldry. It was officially adopted by Maryland in 1904, but the flag in its present form was first flown in 1880, in Baltimore at a parade marking the 150th anniversary of the founding of Baltimore. It also was flown again in 1888, at the Gettysburg Battlefield during ceremonies dedicating monuments to Maryland regiments of the Army of the Potomac. However, it was not officially adopted as the state flag until 1904. The Province of Massachusetts Bay was the 6th state to join the Union on February 6, 1788. Originally the British Province of Massachusetts Bay, it became one of the original 13 sovereign states under the Confederation (Articles of Confederation 1781-1789), and it was the 6th state to ratify the new United States Constitution in 1788. It is also one of the four states to retain the old English tittle of Commonwealth. The Commonwealth of Massachusetts no state flag until 1908. Although it did not have a flag to represent its government in whole, it had a variety of flags used to represent different aspect of the Commonwealth. For example, there was a variant of the white flag with blue seal carried by each of the Massachusetts volunteer regiments during the Civil War. The shield depicts an Algonquian Native American with bow and arrow; the arrow is pointed downward, signifying peace. The state currently still has three official flags: a state flag, a "naval and maritime flag" (despite it no longer having its own navy), and a governor's flag. A blue ribbon surrounds the shield, bearing the state motto Ense Petit Placidam, Sub Libertate Quietem (By the Sword We Seek Peace, But Peace Only Under Liberty). Above the shield is the state military crest: the bent arm of Myles Standish holding a broadsword aloft. The sword has its blade up, to remind that it was through the American Revolution that liberty was won. The state flag was officially adopted in 1908, but had been used unofficially since the American Revolution of the ensign of the Massachusetts State Navy. In 1971, the earlier pine tree was replaced by the current design. The Michigan Territory was made the 26th state of the Union on January 26, 1837. The Michigan Territory (1805–1837), formed from the old Northwest Territory (1787–1803), as the first part of the territory to be admitted to the Union. In 1836, in preparation for Michigan statehood, the Wisconsin Territory (1836–1848) was removed from Michigan Territory, consisting of the present states of Wisconsin, Minnesota, Iowa and the eastern portion of the Dakotas. The present flag, adopted in 1911, is the third state flag. The first flag featured a portrait of Michigan's first governor, Stevens Mason, on one side and the state coat-of-arms and "a soldier and a lady" on the other side. The second flag, adopted in 1865, displayed the state coat-of-arms on one side and the United States coat-of-arms on the other. The present flag depicts the state´s coat-of-arms on a dark blue field. The state coat-of-arms depicts a light blue shield, upon which the sun rises over a lake and peninsula, and a man with raised hand and holding a long gun representing peace and the ability to defend his rights. As supporters the elk and moose are derived from the Hudson's Bay Company coat-of-arms, and depict great animals of Michigan. The bald eagle represents the United States which formed the State of Michigan from the Northwest Territory. The design features three Latin mottos From top-to-bottom they are: 1. On the red ribbon: E Pluribus Unum (Out of many, one), a motto of the United States. 2. On the light blue shield: Tuebor, (I will defend). 3. On the white ribbon: Si Quæris Peninsulam Amœnam Circumspice (If you seek a pleasant peninsula, look about you), the official state motto. The Minnesota Territory became the 32th state to join the Union on May 11, 1858. The Minnesota Territory (1848-1858) was carved out of the Iowa Territory (1838–1849) to allow the eastern portion of the territory to be admitted to the Union as the State of Minnesota. The first flag of the State of Minnesota was designed by the Amelia Hyde Center of Minneapolis in 1993, a prototype flag was made by a local embroiderer Pauline Fjelde, which then won a gold medal at the Chicago World's Fair. The flag was two-sided, white on one side and light blue on the other, In the center was the state seal wreathed with white moccasin flowers, on a blue field. A red ribbon in the seal bore a motto in French, L'étoile du nord (The North Star). The years "1819" for the establishment of Fort Snelling, "1858" for statehood, and "1893" for the adoption of the first state flag appeared in gold around the state seal. "Minnesota" was written under the state seal in gold and 19 gold stars arranged in clusters to form the points of a star, representing the fact that Minnesota was the 19th state added after the original 13 states. The 87 circles around the seal represented Minnesota's 87 counties. The flag was redesigned in 1957, eliminating the different-colored sides in favor of a blue field on both sides. This made the flag less expensive to manufacture and also more durable in high winds. This opportunity was used to correct an error of the flowers used on the seal; instead of a Pink and White Lady's Slipper, the 1893 flag showed a variant that was not native to the state. The current flag was adopted in 1957 and the state seal in the flag was modified in 1983. The Mississippi Territory became the 20th state to be admitted to the Union on December 10, 1817. The Mississippi Territory (1798–1817) was formed from land donated to the Federal Government by State of Georgia in 1798. The State of Mississippi was the last portion of the Mississippi Territory to become a state in 1817. The Flag of the State of Mississippi was adopted by the State of Mississippi in 1894. It is the only United States state flag that incorporates the Battle Flag of the Confederacy. Because of this, in 2001, a state referendum to change the flag was put before Mississippi voters. The proposal would have replaced the Confederate battle flag with a blue canton with 20 stars. The new flag proposal was soundly defeated in a vote of 64% to 36% and the old flag was retained. Learn about more flags that have flown over Mississippi. The the southeastern portion of the Missouri Territory became the 24th state to be admitted to the Union on August 10, 1821. The Missouri Territory (1812–1821) was originally known as the Louisiana Territory (1805–1812) and was renamed to avoid confusion with the new State of Louisiana (admitted 1812) right before the War of 1812. On March 2, 1819, most of the Missouri Territory south of the parallel 36°30' north was designated as the new Territory of Arkansaw, later renamed Arkansas (1819–1836). The southeastern portion of the Missouri Territory was admitted to the Union as the State of Missouri in 1821. The flag of the State of Missouri was designed and made by the Marie Elizabeth Watkins Oliver in Jackson, Missouri, the wife of former State Senator R.B. Oliver. Her design was adopted in 1913 and remains unchanged to this day. Her design consisted of three horizontal stripes of red, white and blue. The colors reflected the state's historic status as part of New France (French Louisiana). In the center white stripe is the Seal of Missouri, circled by a blue band containing 24 stars, symbolizing Missouri's admission as the 24th U.S. state. The Montana Territory was the 41st state to be admitted to the Union on November 8, 1889. The Montana Territory (1864–1889) was formed by an Act of Congress, as part of the reorganization of the Idaho Territory (1863–1890) and signed into law by President Abraham Lincoln in 1864. The area of the Montana Territory were those lands of the Louisiana Purchase (1804) west of the Continental Divide. The flag of the State of Montana was first used by Montana troops deploying for the Spanish-American War. It was adopted in 1905 as a state flag, consists of the image of the Montana State Seal centered on a blue field. Within the seal, a plow, shovel, and pick rest in a field in front of the Great Falls of the Missouri River. The ribbon contains the state motto Oro y plata (Gold and silver). The word "Montana" above the seal was added in 1981. In 1985, the flag was again modified to specify the font used in "Montana." Sources: Much of the text on this page was modified from text on the "Flags of the World" website and from "Wikipedia."